(Bhindranwala the Saint Soldier who woke up a sleeping nation). (We will stand firmly with the ideology of Sant Bhindranwale!). (Those who oppose the Singhs will be crushed!). (Not Hindi nor Hindustan, we will only rest after taking Khalistan!). It is here that some Singhs associated with the Sikh Struggle have been kept prisoner by the Indian Government and have made a “Mini-Khalistan”. The Singhs rule here. From the Beant Assassination trial there are Bhai Balwant Singh Rajoana, Bhai Navjot Singh, Shamsher Singh, Naseer Singh, Gurmeet Singh and Lakhwinder Singh Lakha along with his wife Bibi Baljit Kaur. In total there are 15 prisoners here who have completely exasperated the jail staff and officials. Bhai Sahib Bhai Jagtar Sigh Hawara and his companions who escaped from the prison at night on January 22nd, 2004, have also ruined the sleep of the Indian Government. Despite the fact that there are many other Singhs being held in India’s other jails, but the situation in Burail Jail is not like any other. It is the same situation as Bhai Harjinder Singh Jinda and Sukhdev Singh Sukha had created in 1990-91 in Poona Jail, after which they were executed. From 1996 onwards, everyday, the Ardaas for the achievement of Khalistan is heard via the loud speaker, which was the achievement of Bhai Jagtar Singh Hawara, who used legal channels to get permission for this. The Singhs completely control the Gurdwara in the jail. Bhai Jagtar Singh Hawara, who punished the evil Chief Minister Beant Singh, who had inflicted unspeakable atrocities upon the Sikhs, was also about to punish the butcher KPS Gill when an informant had him arrested from the Jalandhar Bus Stand. After severe torture, in 1996, he was imprisoned in Burail Jail. In Burail Jail, all the Singhs pledged to carry forward the struggle for Khalistan under the leadership of Bhai Jagtar Singh Hawara and also made the government machinery accept defeat. In Burail Jail, all the Singhs pledged to carry forward the struggle for Khalistan under the leadership of Bhai Jagtar Singh Hawara and also made the government machinery accept defeat. It was to such an extent that they refused to go to outside courts and the officials were forced to have the court in the Jail. 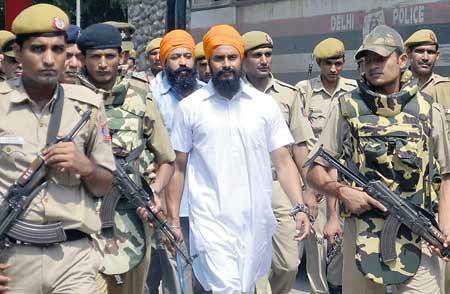 Bhai Sahib’s demeanor in jail was so warm and friendly that all the staff loved him. The staff members treated him like a family member. On every Sangrand, Bhai Sahib used to make kheer in the Gurdwara and it was so loved by all that even after his escape people still recall it. While Imprisoned, Bhai Jagtar Singh had taken a vow in the presence of Guru Granth Sahib that in whatever circumstances, he would leave the jail and move the Sikh struggle forward. Bhai Sahib is still committed to this goal. Those Singhs who have spent time with Bhai Hawara say that he is not one of those people who would turn his back on the movement and run away. He himself has attached many of those people to Sikhi and taken many anti-Sikh people and put them on the correct path. Bhai Sahib wants that the next generation of Sikhs, who have been attacked on all sides, should establish a Sikh Media (TV Channel) in which the goal of independence can be openly discussed and they can be liberated. He also desires that a common front, under the leadership of Akal Takhat Sahib be created by all Dharmic Jathebandis to preach in the villages. And this is not all. All courts in India start with the Indian National Anthem. In Burail Jail, it begins with “Deh Shiva Bar Mohi ihai…”. The Judge also speaks to the Singhs politely. If he speaks even a little loudly, slogans of “Raj Karaega Khalsa” begin. During the Court being held at Burail Jail, the Singhs in the Beant Assassination case all gather under the Kesri Nishaan Sahib and take an oath to work for the Chardi Kala of the Panth and then respectfully put the Nishaan Sahib in front of the Judge’s desk. The respect of the Nishan Sahib is to such an extent that if it tips over or falls, the court hearing is cancelled and postponed. In Burail Jail, the Singhs’ langar is also not common with other prisoners. All the Singhs prepare their own food. No Jail official can come near to barrack when smoking. Attendance is taken for all prisoners but not the Singhs. All other prisoners receive common utensils but the Singhs have special ones allotted. Every Sangrand, ardaas for Khalistan is done in the jail and all the Jail officials including the Superintendent also take part. All arrangements are made by the jail. What more can be said? The Manual in Burail Jail is just a bit different. Because of the Singhs, instead of the Indian Jail Manual, the “Khalistani Jail Manual” is in effect. All the Singhs being held here are in essence “Jinda Shaheeds” or living martyrs as they have suffered unspeakable torture but are still determined to take the Sikh Struggle forward. Because of their wisdom, bravery and smarts, they have a major influence on the Jail Staff. Where I do ardaas to Akal Purakh to keep these Singhs in Chardi Kala, I also request that the Sikh Nation give them all possible assistance. Originally published by sikhfreedom.com, commentary by Sikh24.com Editors.